Is solar energy actually a net electricity producer? Let’s see whether these points make sense or not. This is an intruiging point that I actually didn’t come across before. The obvious implication would be: if the production of solar panels consumes more electricity than a solar panel generates during its lifetime, then the whole investment strategy would be flawed. This means that we would still need to substantially rely on fossil fuels (or nuclear) and decoupling our economic growth from dirty technologies would be impossible. Also, the whole Energiewende would be meaningless. Since then researchers have invested much time into understanding which green electricity technologies are net producers of electricity and have tried to come up with a m easurement of this. 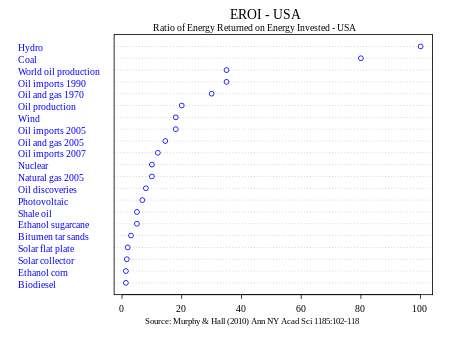 The main measure used nowadays is Electricity returned on electricity invested (EROEI). If this measure is larger than one then the electricity balance of e.g. the solar industry is positive, meaning that e.g. solar panels produce more electricity than their production consumes. A well-known graph for the US is the one on the left. It shows that basically hydropower has the highest return on energy, while biodiesel seems to have the lowest. Other estimates by M. Dale in his article “A Comparative Analysis of Energy Costs of Photovoltaic, Solar Thermal, and Wind Electricity Generation Technologies” suggest that the life-cycle costs (these “include all of the energy inputs over the full life-cycle of the system, including end- of-life, normalized by the total lifetime electricity output from the system”) of wind and solar are always below unity, suggesting that they produce more energy than their lifecycle consumes. Thus, we can debunk the first claim: In general wind, solar and hydro nowadays have a positive energy balance. As for points 2) and 3) I will treat them together: The idea to subsidize wind and solar energy arose for three main reasons: Learning-by-using, dealing with externalities and energy liberty/decentralization. Assume a technology is too expensive relative to others in order make it to the markets. This was, for example, the case for solar energy or wind energy. If no policy is undertaken that incentivises the use of these alternative technologies then little investment in R&D will ever be undertaken. Subsidies in this case change the relative prices of the technologies that are already established on the market to those that one wishes to introduce. For example, if coal is cheaper for electricity production than solar, then everyone will use coal. If one subsidises solar such that the price of solar is below the price of coal then consumers will switch to using the now cheaper solar electricity. But subsidising solar is then only really useful to society if not only relative prices are tilted in favor of solar energy, but also if there were to be additional benefits from this policy. One of those additional benefits is that fossil fuel consumption leads to climate change or direct damages to our health, and this externality is not included in the price of fossil fuel use. Subsidies is then one way in which fossil fuel use could be reduced since the lower-priced technology (in this case e.g. solar due to the subsidy) will be chosen by the consumers. One problem of course is that a government should not, if possible, permanently distort markets. And here learning-by-using is the second argument that is forwarded in support of wind or solar subsidies. Looking at the graph on the right we see price evolution of solar energy from 1977 to now. 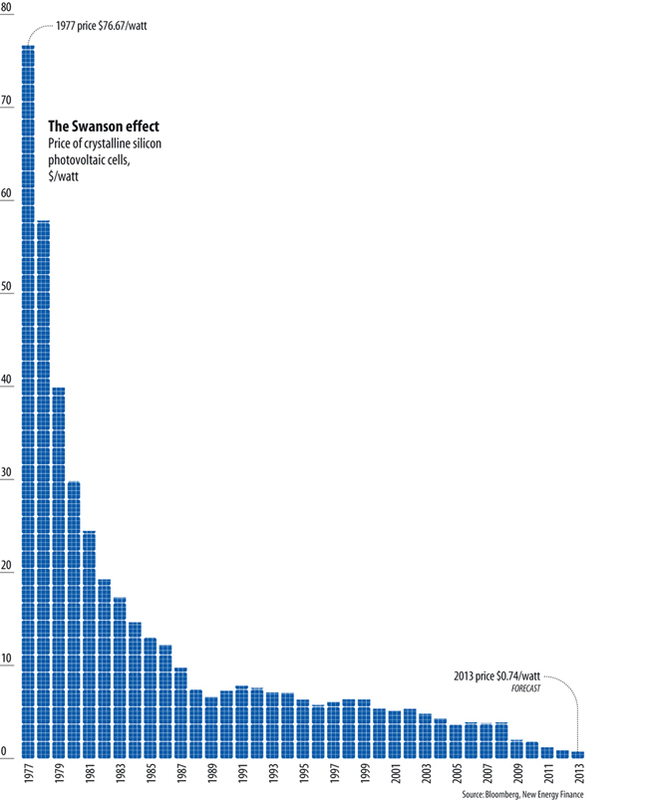 In effect, the cost of solar panels has decreased from $76.67/watt in 1977 to just $0.613/watt now. Thus, subsidising renewable energy leads to substantial learning-by-doing. This reduction in the costs of production or lifecycle costs has led to solar and wind energy to be competitive to fossil fuels and nuclear in many areas of the world. Hence, a short period of subsidising has helped to squarely establish renewable energy on the markets at now competitive prices, which made a long-run transition to renewable energy possible. Indeed, many European countries have already started to reduce their subsidies for alternative energy since these have now become sufficiently cheap such that they do not need to be subsidised as extensively as before. The last advantage of focusing on wind and solar energy is that this actually leads to a good degree of energy liberty for consumers. If a consumer has solar panels on the roof then this will, to a large degree, make him/her independent of the profit-seeking behavior of the large electricity giants. The new fashion term here is that one changes citizens from consumers to prosumers – thus to consumers that also produce. The final argument raised was that mostly the alread rich have benefitted from these subsidies since they were the only ones who could actually afford to pay up front the installation costs. I have not seen any data on this, but my hunch is that this view is most likely correct. Placing solar panels on one’s roof requires one firstly to have a roof, so that only house owners are the ones that are able to install solar panels. Homeowners tend to be richer than those renting, thus this already supports the point above. Also, poorer homeowners tend not to have sufficient capital to install solar panels on their roofs. So quite clearly these subsidies have gone to the rich. But then again is this a problem? If the main goal is to push forward and make the energiewende happen, then the governments need to undertake a policy that induces learning-by-doing. One option that I was told should have been pursued is that the government itself should have invested in solar or wind energy instead of subsidising their use. The profits that they could have obtained from this could then have been used to e.g. reduce the income gap. But this argument falls short because of two observations. One, whenever a government takes over the job of the private market it does it terribly bad. Governments tend to be horribly inefficient and if there are no competitive market forces that drive one improve and innovate then both improvements and innovations won’t happen. Two, by only subsidising the use of solar panels the government only needs to invest (roughly) an amount of money that is equivalent to the costs of solar energy minus the costs of fossil fuel-produced electricity. For Germany this implies that the government’s subsidies are roughly 1/3 of the total costs of solar energy. This is still a large number, but roughly 20 billion euros less (in 2013) than the government would have needed to invest if it had not subsidised solar energy but instead financed the whole solar electricity production by itself. An investment of this scale would be too costly for governments to carry out by themselves. Hence, the overall conclusion is that solar energy, and green technologies (wind, hydro) in general, are net energy producers, thus supporting the point that an energiewende based upon these is useful. In addition, substantial learning-by-doing has already made these technologies competitive to traditional means of electricity production, wherefore the previously high subsidies seem justified. Furthermore, the additional points of energy liberalization/decentralization and getting rid of the problem of externalities from using fossil fuels are the main reasons for undertaking this energiewende policy. Finally, while it is true that mostly the rich benefitted from these subsidies, the energiewende would not have happened otherwise since governments would have been unlikely to afford this transition by themselves, and in addition markets tend to be better at innovation and providing a competitive market structure that a purely government-financed programme would not have yielded.